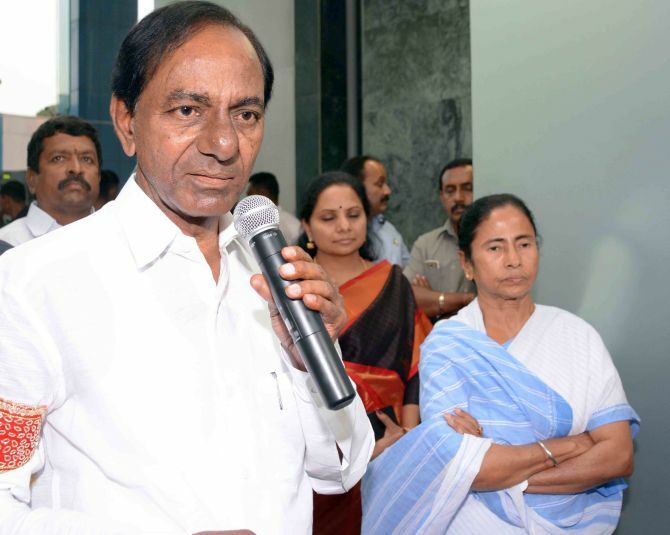 Setting in motion the process to explore ways to forge a non-Bharatiya Janata Party and non-Congress federal front before the Lok Sabha polls, Telangana Chief Minister K Chandrashekhar Rao on Monday met his West Bengal counterpart Mamata Banerjee, a development the Telangana Rashtra Samithi leader called the "beginning of the whole thing". Talking to journalists after the meeting, Rao said the process for creation of a federal front has begun and he would now talk to like-minded parties. "We are trying to bring in a real federal front. Today is the beginning of the federal front, the beginning of the whole thing. We had fruitful discussions about it. We will talk to all like-minded parties to create an alternative against the Congress and the BJP," he said after a two-hour meeting with Banerjee. With TMC chief by his side, Rao said,"The country needs something good. It is in need of miracle. If the BJP goes and the Congress comes, will it do any miracles?" He underscored the need for an "alternative agenda and alternative political force" in the country. When asked about who would lead the proposed front, he said it will have a collective leadership. Rao said the federal front will be a "people's front". Banerjee said talks for a broad based front have just begun and there is no need for hurry. "In a democracy such situation comes up when all parties need to come together to work ... We don't want a particular party to rule the nation and do whatever they like," she said. "Every political party is having its own identity. No one should feel proud of their identity. Every political party has its regional strength, has its national strength, and everyone should respect each other", she said. When asked whether her party was also averse to joining hands with the Congress, she retorted, saying "Don't put your words in my mouth. Whatever Mr Rahul has said, I fully agree with him. He has expressed his views. What is the harm in it? "Rahul had expressed his views yesterday, but he has not asked what will be our view ... We will express our views," she said.